Teaching assistant Jenny Pianucci, left, helps student Matthew Detgen use a switch to register a smoothie sale for Julia Stoumbos, program manager at the Kessler Foundation. Last fall, Matheny received a $30,000 Community Employment Grant from the Kessler Foundation to fund our “21st Century Skills Transition to Employment Opportunities Program.” This grant will enhance and expand prevocational realistic learning activities for our transition students (ages 18-21). Recently, Julia Stoumbos, Kessler Foundation program manager, visited Matheny to view the program firsthand. 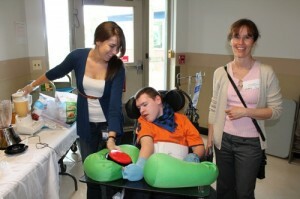 Among the activities she observed was the Tea Time Café, a snack bar run by students for Matheny employees. Twice a week from 10:45 a.m. to 12:15 p.m., three students, a teacher and an occupational therapist are stationed in the rotunda near Matheny’s dining rooms to offer cappuccino, smoothies, English muffins and other treats for sale. A new feature of the Tea Time Café is the opportunity for students to use two HP Touchsmart 610 xt series computers, donated by Francis Mancho of Budd Lake, NJ. 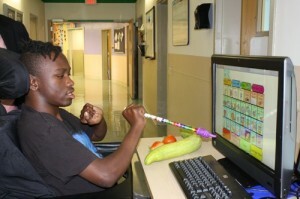 Mancho had received a $30,000 grant from the Jenny Jones Foundation so Matheny could purchase the computers, which are important because the students’ disabilities make it difficult for them to ring up sales on a cash register. Student Yasin Reddick practices using one of the new Touchsmart computers. This entry was posted in Uncategorized and tagged Francis Mancho, Kessler Foundation, Tea Time Cafe. Bookmark the permalink.